On the left, they see sharpened criticism of Israel and anti-Semitic statements from members of Congress. On the right, they see an unprecedented relationship with the Israeli prime minister and major gestures of support for Israel’s security. All around, it looks like a rosy picture for Jewish Republicans seeking to re-elect Donald Trump in 2020, and to attract some centrist Jews — long an unfulfilled dream of the GOP — in the process. As the run-up to the 2020 elections begins, conservatives are betting that this is the year they can win a major share of Jewish voters for the Republican Party. 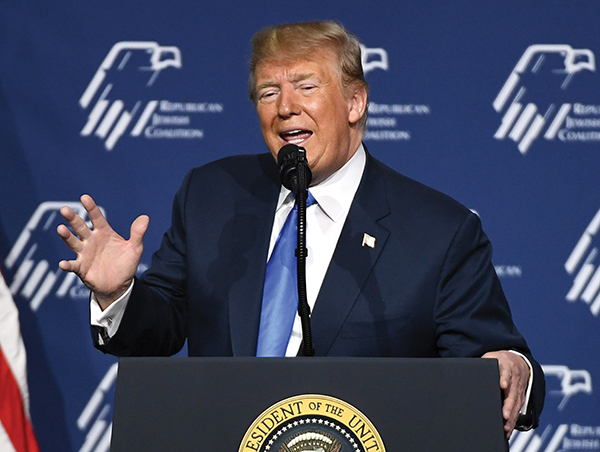 The Republican Jewish Coalition has pledged over $10 million to the effort of convincing Jewish voters — who have remained deeply committed Democrats for many an election cycle — to support President Trump in 2020, according to Politico and confirmed by NJJN. Their case for Trump is two-fold: on the one hand, they point to foreign policy achievements under the Trump administration like last year’s U.S. embassy move from Tel Aviv to Jerusalem, the pullout from the Iran deal, and Trump’s recent recognition of Israeli sovereignty over the Golan Heights. On the other hand, they point a finger at the Democrats for failing to adequately respond to comments by first-term Rep. Ilhan Omar that were widely deemed to be anti-Semitic. But observers are quick to note that in spite of Trump’s record on Israel, a mass defection of Jewish voters from the Democratic Party seems unlikely. While 71 percent of Jews voted for Hillary Clinton and 24 percent for Trump in 2016, the 2018 midterms showed somewhat diminished support for Republicans among Jewish voters, with 79 percent voting for Democrats and 17 percent voting for Republicans. That constitutes a decline from the 2014 midterms when 66 percent of Jews voted for Democrats and 33 percent voted for Republicans. Conservatives have repeatedly invoked Ilhan Omar and Rashida Tlaib, two freshman members of Congress, from Minnesota and Michigan, respectively, who have voiced support for the Boycott, Divestment, and Sanctions movement targeting Israel, as evidence for a slip in support for Israel among Democrats. “It’s plain that the Democrats are behaving as though their party’s Jewish support is invulnerable and inevitable,” Jeff Ballabon, a former adviser to the Trump campaign, wrote in an email to NJJN. Ballabon recently founded “Jexodus,” which he says is a “nonpartisan” organization with the goal of exposing anti-Semitism among progressive Democrats and widely perceived as an attempt to spark an exodus of Jews from the Democratic Party. “I think plenty of Jews are frustrated by that — but it’s almost a moot question: if the Democrats continue to mainstream the Ilhan Omars of their party, Jews simply will not find themselves any more welcome there than in today’s UK Labour Party,” a reference to that party’s leader, Jeremy Corbyn, some of whose comments have been characterized as anti-Semitic. They also noted the other issues — like health care and immigration — that draw Jews to the Democratic Party. “There’s no question that Jewish voters are not one-issue voters; we know that Jews vote on a wide range of issues and prioritize domestic policy issues,” said Halie Soifer, executive director of the Jewish Democratic Council of America. Trump himself has been accused of engaging in some of the same anti-Semitic stereotypes that have gotten Omar into trouble. At this year’s RJC conference, he repeatedly referred to Israel as “your country” while addressing the crowd. Strauss says those words were addressed to Israelis in the crowd. What gives some Republicans hope, and their critics pause, however, is demography. The Orthodox have proven to be Trump’s biggest supporters in the Jewish community. A whopping 71 percent of Orthodox Jews said they approved of the president’s performance compared with 77 percent disapproval among American Jews as a whole, according to a 2017 survey by the AJC of American Jews. All of this points to a situation in which partisanship on Israel and anti-Semitism remains high. At a meeting between Jewish leaders and Trump on Tuesday, several liberal Jewish groups, including the major Reform and Conservative organizations as well as the Anti-Defamation League, were not included, while Orthodox and other right-wing groups were. Shira Hanau is a staff writer at The New York Jewish Week, NJJN’s sister publication.